While I still have loads of yarn piling up and access to the guild’s Ashford knitter’s loom I’m putting both to good use. 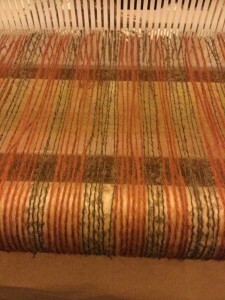 On Friday I threaded the loom with almost five meters worth of warp and set forth on another weaving experiment. 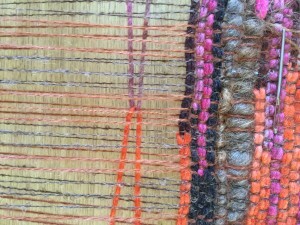 I won’t call this Saori weaving–rather Saori-style. 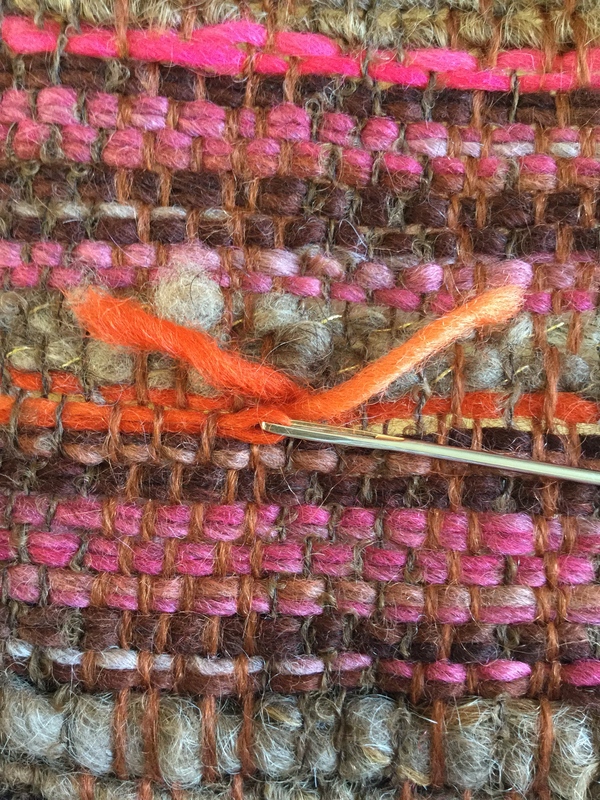 It’s hitting a lot of the right themes for me–using up stash yarn, making use of the Ashford loom, thinking about color combinations (in this case pink, orange and brown) and learning new techniques. 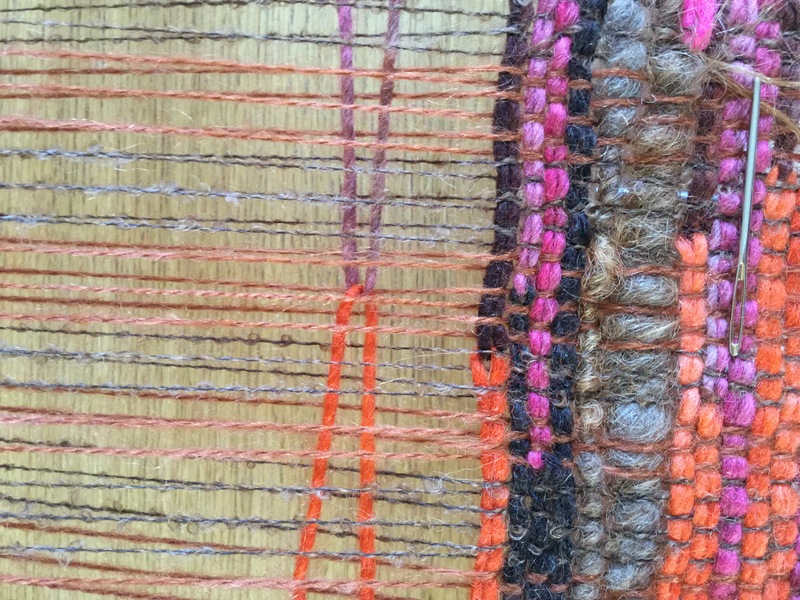 Saori weaving is also a perfect canvas for art yarn– you know all that fanciful stuff we love to make, but sometimes struggle to use. 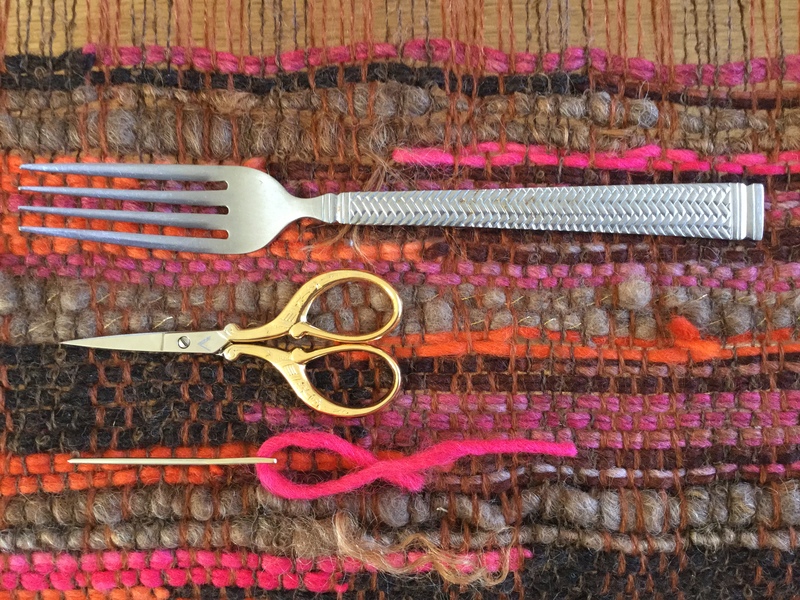 Saori-style weaving is ideal for those of us with rigid heddle looms. It’s a plain weave, experimental, free-style approach to weaving pioneered in Japan. (The Saori website has all the history.) Saori emphasises finger manipulation techniques, color, texture and self-expression. I’ve seen it likened to painting with yarn. 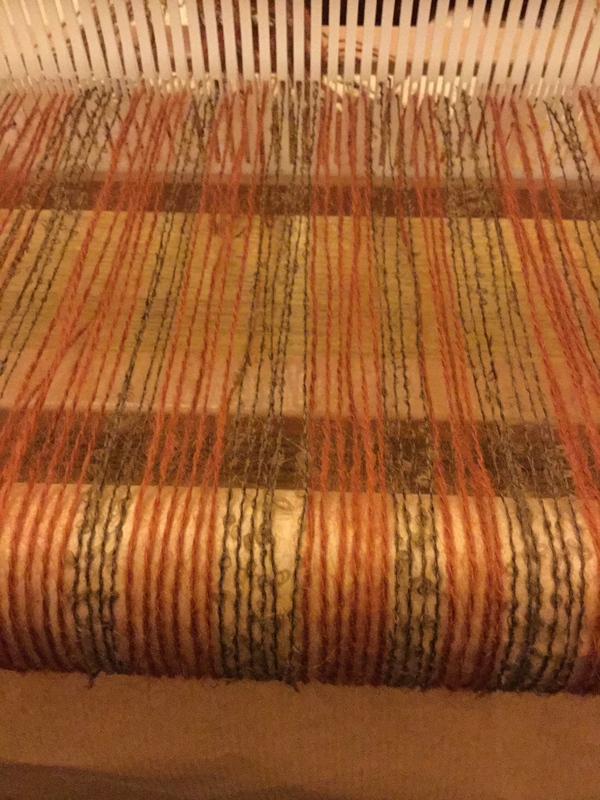 I threaded (warped) the loom with some commercial mohair and boucle yarn from Texere. Loading five meters’ worth took awhile, but I’m hoping the length of fabric will give me something useable for a garment at the end. For the weft yarns I’m using a mix of handspun and blue-faced Leicester pencil roving which I dyed. 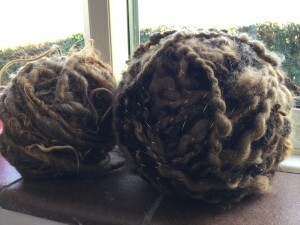 The roving is lovely and soft–well-suited for weaving. What attracted me to Saori-style weaving was the clasped warp technique (useful video here) which would allow me to make a zig-zag weave. 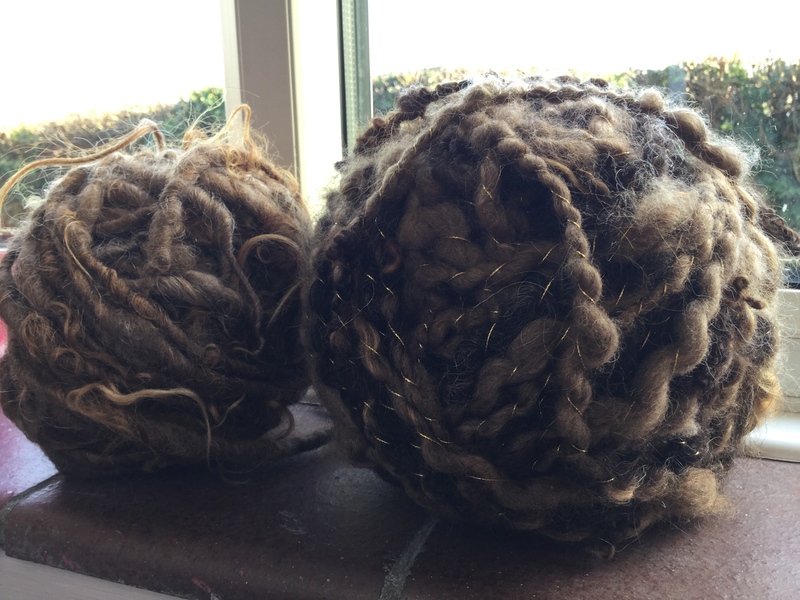 And as the “plan” for this project crystallised I realised it would be a perfect time to use this handspun that’s been in my stash for three years or so waiting for a project. 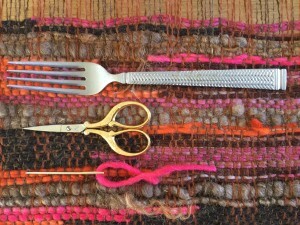 Using a fork as a beater and a tapestry needle to weaving in extra color here and there the fabric is shaping up. I’ve alternated the colors on either side of the fabric–pink and orange first of the left and then on the right, swapping the brown over. 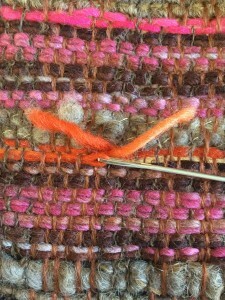 Then I’ve used the brown tailspun art yarn for some additional interest. One of the preconceptions I’ve had to jettison is the idea of pattern. There are some themes in terms of color and texture in the piece so far, but no pattern. How is that going to translate into a garment? My guess is that while I would like to make a jacket out of this piece, I might have to challenge that idea and make something else! This is a great color combo. Can you put some photos up on Instagram of the art yarns you are using? This is really an inspiring project, love it! Thanks! Saori is fun because you don’t need to worry about following a pattern OR making mistakes. It’s all very go-with-the flow!